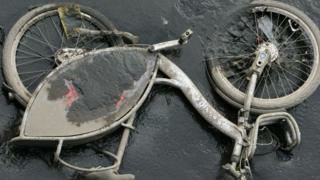 Pictures have emerged of what appear to be several Belfast Bikes dumped in the River Lagan. The photographs were taken last week between the Albert Bridge and McConnell's Weir while the river was at low levels. The public bicycle hire scheme was launched in 2015. On Wednesday the PSNI confirmed that more than a third of the bikes were out of action because of theft or vandalism. Belfast City Council said this is costing ratepayers about £20,000 a year and there are now concerns about the future expansion of the scheme. Since its launch, the Belfast Bikes scheme has almost 5,000 annual members and more than 5,000 casual users. However, 210 of the 576 bikes in the fleet have been taken out of service. Over the Easter weekend, 19 bikes were stolen and a further eight were vandalised. PSNI's Sgt Pete Cunningham appealed for witnesses to "instances of theft or vandalism to report it to the police immediately." Dublin Bikes launched in 2009 and the city's council said it does not gather statistics about theft or vandalism to the bikes because '"they are not a feature of the scheme in Dublin". Is Belfast ready for the cycling revolution?